More information about Akamai to acquire Prolexic (www.prolexic.com), you may visit http://www.akamai.com/html/about/press/releases/2013/press_120213.html. Today, and i got another email from our CDN and DDoS partner, Incapsula that they have acquired by Imperva. This two news has shared one important message to me, that how important DDoS protection is to us in the near future. Today, DDoS has become a very common tool to attack or bring down a web service. Below is annoucement email that we received from Incapsula an hour ago. 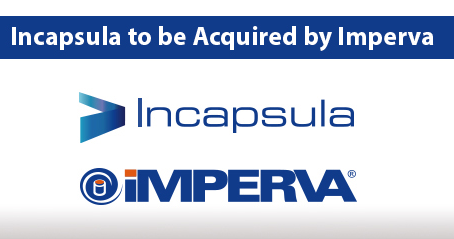 Last week Imperva announced that it will be acquiring Incapsula. The Imperva-Incapsula relationship is not something new and has always been very tight. Incapsula was spun out of Imperva a little over four years ago, and since then Imperva has been the sole investor in Incapsula and has also been a major distribution partner for us. By acquiring Incapsula, Imperva is doubling down on its investment, with the intention of further accelerating and growing our business. Incapsula will continue to operate as a separate company, under the Imperva umbrella, allowing us to maintain our focus and agility while adapting to the security and application delivery changes in the market and responding to customer needs. In 2013 we experienced fantastic growth. The number of websites using Incapsula grew by 600%, our traffic grew by 500%, and we grew our network to almost 500Gbps in capacity, across 15 worldwide datacenters. We introduced new features such as automatic backdoor detection, LoginProtect 2-factor authentication for web applications - and a complete new framework for creating custom caching policies for maximum website performance. Incapsula is now used by some of the largest consumer electronics brands, online retailers, financial institutions and SaaS services worldwide. The future looks bright and exciting. With the additional Imperva backing, we are planning great things for 2014. We just launched our new security engine with its IncapRules language, enabling enterprise customers to take advantage of the most granular controls to protect their web applications, and we are planning to almost double our global network, with four new datacenters coming online in the next 30 days. Incapsula - Model 2104 is not just about website security and acceleration. Incapsula is now a full-blown, Cloud-Based Application Delivery Network. The differences between a Content Delivery Network (CDN) and an Application Delivery Network are huge: it’s like static content vs. dynamic applications, bare metal vs. cloud, or the old way of delivering web applications vs. the new way. We will soon be releasing some great new features which will help our customers continue to scale their online businesses in a more effective and resilient way, using means that were never before available to them. These are exciting times for Incapsula and our customers and we promise to continue delivering! At EVERWORKS, every of our solution has the same working concept like what Prolexic and Incapsula do now - that is giving you the simplest and easiest ways to establish your internal DDoS solutions. More info about our DDoS protection, visit EVERWORKS.com or our product page at http://www.everworks.com/Services/DDoS. We at EVERWORKS.com has working with both of this DDoS protection for some time, and both their pro and cons. We believe both are still among the best DDoS protection solution for Malaysia or even Asia web hosting industry. The implementation of their DDoS solution is pretty much easy, and you just need to change your DNS setting to their proxy network. Client with server colocation and dedicated server in Malaysia can simply deploy this solution without have to move your server from one datacenter to another. Stay tune! We will be posting another interesting blog that related to the different between Prolexic and Incapsula.